A campaign in 5 parts that takes you to New York, London, Cairo, Kenya, and Shanghai. 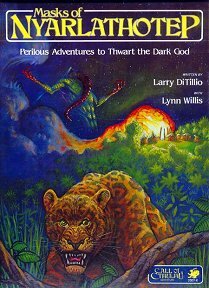 Publisher's blurb: "This roleplaying classic is a series of linked adventures forming one long and unforgettable campaign. Horrifying deeds and dangerous sorcery dog those who attempt to unravel the fate of the Carlyle Expedition. The non-linear narrative keeps players baffled and on their toes."